HAMDEN, CT- The Quinnipiac Bobcats played their first home game of the season Friday night welcoming in the St. Peter’s Peahens as part of the Quinnipiac Invitational tournament. Earlier in the day Dartmouth had downed Hartford in game one of the tourney, but the QU fans who filled a bleacher section of Burt Kahn court were able to see their team in action. The crowd, lead by a crown wearing supporter, were more into it than most I’ve seen across the region, and they kept with it as QU kept up their efforts. The Bobcats would take a hard fought set one, but end up losing the next 3 to a resurgent St. Peter’s team to lose the match 3-1. After an initial back and forth in set 1, QU broke out to a 22 to 16 lead, before the Peahens closed the gap to 24-11, until the Bobcats closed the door. Highlights for Quinnipiac continued including a few early points, an Olivia Grattan block, Stephanie Biediger’s kill off the blockers and out of bounds, Taylor Payne’s whack to a gap, a big smash from Kelby Carey, a rocket launched from Payne, Amanda Armstrong’s kill off the blockers, and another kill soon afterward, Kayla Lawler’s turning tap over, another kill from Biediger, a good defensive save from Tracey Wright prior to a two hit error by St. Peter’s bringing them a point. Later in the game, Grattan launched another kill, Armstrong and Carey shared a kill, Payne sent a kill over, later Carey hammered a shot over, Armstrong struck again, and would close the set as well with a kill. Peahen highlights included a good defensive save by Stephanie Phillips earlier in the set, a service ace by Monique Flores just in bounds, a later good save by Katie McFadden, a great diving save by Shannon Doheny, Kassi Wirth’s tap off the blockers an in, Paige Peterson launching a blast off the defenders and out of play, and another Wirth tap in, as well as Phillips delivering a block late in the set. 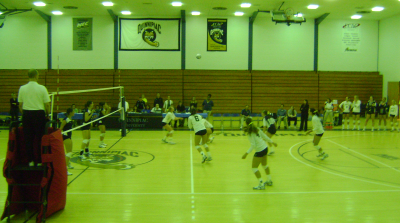 In set 2, Quinnipiac raced out to a 7-1 lead, but St. Peter’s fought back to a 7-7 tie. The two teams continued to rally back and forth to a precarious 24-24 tie before the Peahens picked up two points for the set win. Highlights for St. Peter’s included Chloe Rost sending the ball through he blockers to get her team on the board. Kim Mendoza had a good defensive save soon afterward. Mendoza was able to whack a ball through the blockers, and Phillips served up two service aces. A Wirth tap in succeeded again midway through, and Mendoza also used a light touch for a point. Wirth and Anna Molokotina came up with a block that QU struggled to return. Phillips unleashed a cross court kill in, and not long after ricocheted an attack off the blockers. Rost got in on the kill in the waning moments of the set. Corey Haynes served a couple of service Aces up, and Phillips hit another cross court kill. Molokotina tapped the ball over to build the lead, on the way the set victory. Quinnipiac’s highlights featured the opening salvo of Grattan and Biediger’s block, followed by a Grattan kill to the gap, another point, and then a big kill from Grattan on an overpass. She struck yet again with a blast, then Payne sent the ball flying off the defense. After St. Peter’s got back into the set, Payne hit another smash over, Logan Riker served up an Ace, and Carey unleashed a missile of a kill. Lawler light tapped it over, and Carey had another service Ace for the Bobcats. Armstrong had a kill following that. A little later, Payne received the set and used a quick misdirection, the next QU point came from Carey. During the Bobcat come back Carey sent the kill over, Armstrong and Biediger shared a block, and two Carey Aces in a row helped the cause before St. Peter’s closed it out. Set 3 reached a 13-13 tie midway through but St. Peter’s rolled to a 20 to 13 lead after that. QU tried to get back in but the Peahens took it 25-17. Highlights for the Peahens included Haynes with an early kill, Mendoza’s kill through the blockers, Phillips whap which was not returned, a block from Rost, and another, followed by Mendoza’s big time kill, she would strike again soon afterward. Mendoza had a good defensive save during a long rally, as did McFadden later on. For Quinnipiac, Biediger had a hard spike early on, Payne whapped the ball off the blockers, Payne and Armstrong had a block, Carey crushed the ball over, and spiked into a gap. Armstrong used a light attack to good effect, Lawler redirected a hard dig by one of her teammates into the opponent’s zone, Biediger sent another kill off the blockers. During a scoring drought for the Bobcats, Lawler still picked up a good defensive save, later Tracey Wright had a huge good diving save to keep the ball in play, and later Riker had a diving save of her own which allowed Carey to hurricane a shot over later on. Biediger’s attack bounced off several opponents before dropping I though that would be the last QU point of the set. Set 4 opened closely, but at about the 10-12 mark the Peahens started rolling again, and it was soon 21 to 12. With that lead, QU did try to battle back, but a 25-15 set win would follow for St. Peter’s. Highlights for the Peahens had both Mendoza and McFadden picking up good saves on the first rally, though QU did pick up the point. Later Haynes picked up a kill as did Wirth, and McFadden had another good save later on. A desperate dig by Mendoza sailed over the net and landed in for a point anyway, Molokotina’s tap attack succeeded, and on the next point an errant Quinnipiac set sailed over the net and Rost sent it return to sender, and picked up a block a point later. Phillips used a tap attack, later her teammate Haynes also used a light kill. McFadden served up an ace when the ball hit the net and dropped into the QU zone. Wirth came up with the block for the last point of the match. Quinnipiac’s highlights had another kill from Payne, a tap from Lawler, another big smash from Grattan, Armstrong finding a gap and threading the ball into it, another kill from her later on, a blast from Biediger, and two kills in close succession by Grattan. Quinnipiac will be searching for its first win of the season on Saturday with two more games in the tourney. The Peahen’s are now 4-4 on the season. Women’s Volleyball: Johnson and Wales sweeps St. Joseph in 3 sets. Women’s Volleyball: Dartmouth tops Quinnipiac in close 3 sets.